DOES THIS STORY MAKE YOU WANT TO BRUSH YOUR TEETH? The army had to make sure their soldiers were healthy before they sent to them war, and for William Henry Lynch that meant a serious visit to the dentist. When the war first broke out, around 35% of volunteers were rejected due to poor teeth. New Zealand volunteers were known for having teeth so bad that when they bit into their rock solid rationed biscuits, their teeth sometimes snapped. If someone was sent to war with such poor oral hygiene, they were at risk of further infection and disease, especially since the conditions on the front were so horrible. The dental history sheet for William Henry Lynch states that his mouth was in such bad shape, he was required to have all of his remaining teeth pulled out. He was fitted with top and bottom dentures while he was at sea on his way to Egypt. A ship seems like an unusual place for a dentist office, especially when volunteers were being rejected for poor teeth, but William was a special case. In school William had been in the cadets and when he left school he served in the territorial forces. William had previous military experience and it would have been hard to say no to an experienced soldier, even one who needed so much work to get him fit for active service. William Henry Lynch - top row, second from left. 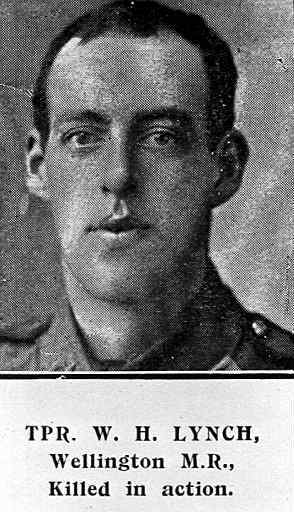 You have been given William's attestation form, which decribes the condition his teeth were in when he enlisted. You are now tasked with discovering more of the story behind WIlliam Henry Lynch. How much of his story can you piece together? The suggestions below will help you on your research journey. The How We Find It Fact Sheet will also be a helpful tool in helping you discover the pieces of William's puzzle. You're in luck, William served in the New Zealand Army and so his records will be able to be found online at the Auckland War Memorial Museum Cenotaph. This is your most important search. Collect as much information as you can. Once you've found William's Serial Number move to Archway and search for his service documents there. New Zealanders had terrible teeth in 1914 - William Lynch was no exception. Use Google to find an outline map of healthy adult teeth. Use William's dental health sheet to identify which teeth he had to have removed and which had already rotted away. Use DigitalNZ to search for 'dentist'. Narrow the search by date to the 1910s. Find photos of soldiers like William receiving dental treatment during the war. William's father, Daniel Lynch, would have had a special card delivered to him with a photo of William's grave and the exact location should he ever be able to visit. Use William's Service Number to search for the location of William's Grave. Download the Cemetery Plan and use it in conjunction with Google Maps to find his final resting place. WHAT DID THE LYNCH FAMILY HAVE TO DO WITH EMERALD GLEN? Use Digital NZ to search for the school that Oscar and William both attended. Find the photo of them in the school Camera Club. The release of the Kodak camera in 1888 made cheap, easy-to-use cameras available to non-professionals. This amateur culture found form in the establishment of photographic societies and camera clubs throughout the country. It is clear that Oscar and 'Willie' enjoyed their Camera Club with this photo being situated at Emerald Glen, their family home. how many lynches were there? There were many Lynches in the Paekakariki and Paraparaumu area. Lots of William and Oscar's documents give us clues about the Lynch Family. Cenotaph gives us the names of William Lynch's parents Ossian and Annie Gertrude Lynch. Use Births, Deaths and Marriages to work out how many children Annie Gertrude had. Papers Past and Google give us school awards and memorial notices. Can you create a family tree of the people in William's family? How many of them can you connect? Did anyone else serve in the First World War? what did william lynch and the school dental service have in common? The School Dental Service was born. William's dental history is connected with the story of William Henry Lynch who attended Paekakariki School and St Patrick's College.The original document is held by Archives New Zealand - Te Rua Mahara o te Kāwanatanga #R10921324. This story is told with the permission of Judy Caton, on behalf of the Lynch Family. William Henry Lynch trained with the Mounted Rifles at the Awapuni Racecourse. 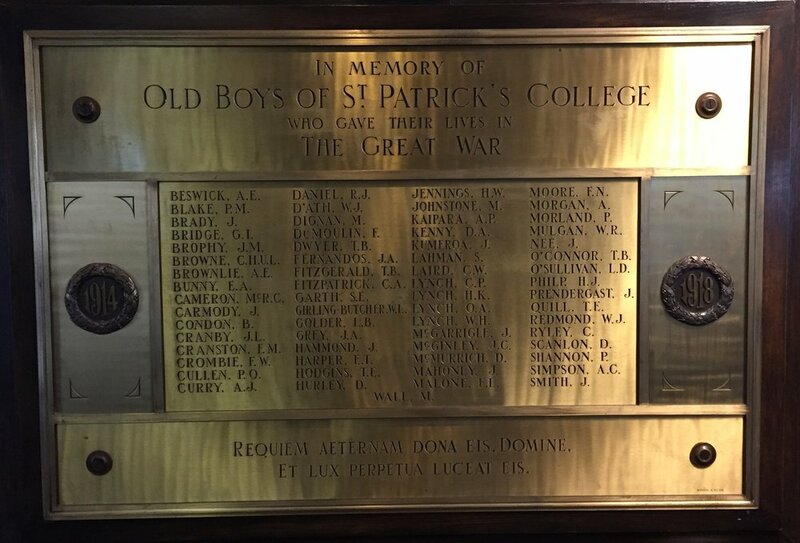 The Walking with an Anzac Team found the first clue in William's story when they visited St Patrick's College in Wellington. Further research on the same platforms you have used today allowed us to discover William's Story. We are so excited to read about your special discovery! We will be sure to pin this information to your soldier Pinterest board and share it with the rest of New Zealand.